This is my first ever review post and I am glad to be doing it with Sorbet. I am a girly girl and sorbet products allow me to be. What I love about them is the they come in numerous colours and my choice this time was pink and white. Of which pink is a colour associated with girls right? Sorbet is a beauty hub that caters for all things beauty. From manicures, pedicures, skin care, hair care, you name it. Can you imagine that they’ve been around since 2004, WOW! 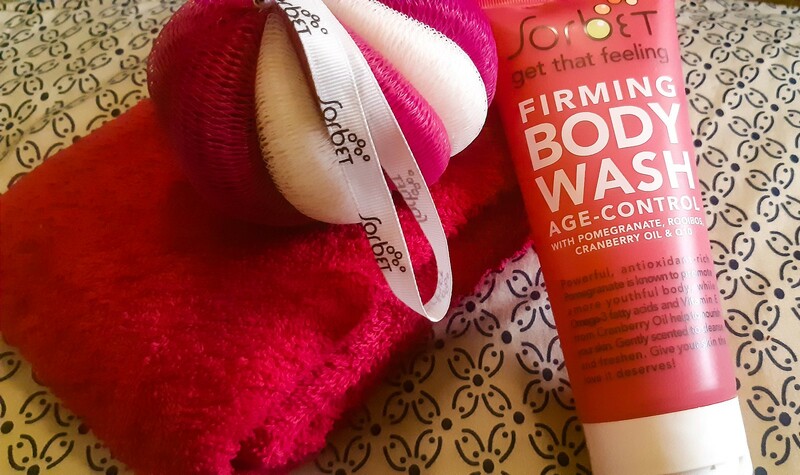 This firming body wash contains pomegranate that is rich in antioxidants that are well known in promoting a youthful body. It’s cranberry oil also has omega-3 fatty acids and vitamin E that help with skin nourishment. What I love most is the scent. Very nice. One of the key ingredients that I also like is glycerine, for a smooth buttery feel. The age control body wash is best used on wet skin. So you apply on your wet skin and gently massage into a lather. Wash off with warm water. This 200 ml body wash is available at Clicks for a good R25. Very affordable. Hmmm. Sweets and flowers🤭. Smells amazing. Glad you found it informative. Hope to see more of you will. Hey there. I discovered your website by way of Google while searching for a similar topic, your site got here up. It appears good. I have bookmarked it in my google bookmarks to come back then.